The auto industry continues to make automobiles that are safer, durable and more reliable for area residents and businesses. The complete safety of all automobile passengers is important, but the glass from windows and windshields can be broken or penetrated during an accident or collision. When your motor vehicle glass is damaged, PG Pasadena auto glass repair technicians are the experienced choice for prompt and reliable restorations. Your complete safety and security is important when damages happen. A simple call will begin the glass replacement process. Not every auto glass repair company has trained technicians or uses factory replacement glass. The use of cheap glass does not provide sufficient protection against future damage. PG Pasadena auto glass repair specialists use only manufacturer grade OE glass that is designed for your safety and security. Professional glass needs to be installed correctly and according to motor vehicle requirements. These experienced technicians provide free estimates before the start of any restoration to provide you with the lowest possible price. Residential vehicles are involved in collisions and accidents, but commercial vehicles can also experience the same issues. The constant traveling of commercial drivers increases the risk of damage or vandalism to commercial vehicles. There are numerous windows installed on a commercial vehicle and one or more of these can be damaged easily. Local business owners choose PG Pasadena car window replacement for restoration after damage occurs. This helps pickups and deliveries stay on schedule and does not cause disruptions along the local supply chain. Broken, cracked and split windshields are not limited to accidents or vandalism. Severe weather can damage the glass by blowing debris directly into the windshield. Severe hailstorms and lighting strikes are known to cause damage to windshields during driving or when automobiles are parked. For emergency and 24/7 services, area residents rely on PG Pasadena auto glass repair. These specialists complete replacements and repairs quickly and during one visit. This free mobile repair service decreases the stress and trauma that is common with windshield and auto glass repair. If you have a damaged or broken auto glass, our technicians for auto glass repair in Pasadena can evaluate the damage. If the glass can be repaired, our technicians will do the job efficiently and in a timely manner. If the damage is severe, our mobile vans for auto glass replacement in Pasadena carry quality manufacturer OE glass and our technicians will do the replacement. 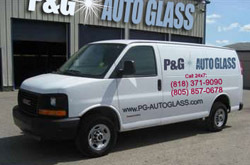 PG Auto Glass offers services in the city of Pasadena, 91101, 91102, 91103, 91104, 91105, 91106 and 91107 as well.